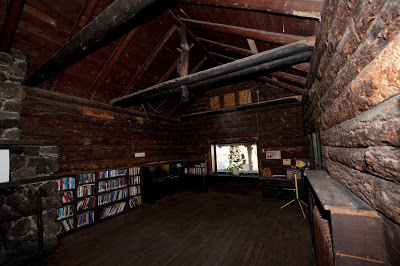 The Whittlesey House was substantially remodeled in the 1940's. 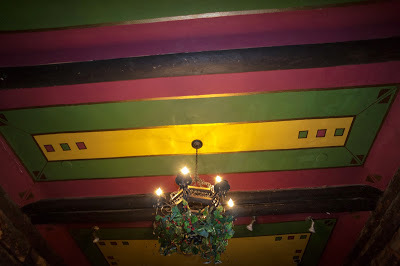 The plaster ceiling in the front room was added at that time. The plaster is a horse-hair plaster on wood lath. It is failing, in places it has failed. 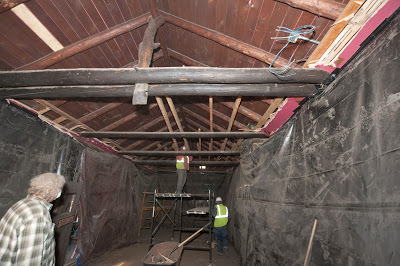 This project will remove the plaster and lath, restoring the original (1903) character to the room. 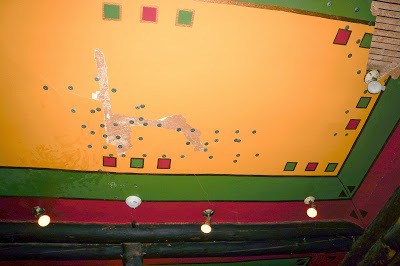 The painting on the plaster was added by Pollie Holland in the mid-1990's. 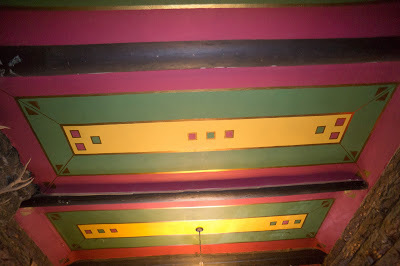 At the time, some of our members hated it, over time it has become a respected and loved part of the front room. Sorry Pollie but your great work will be gone soon. 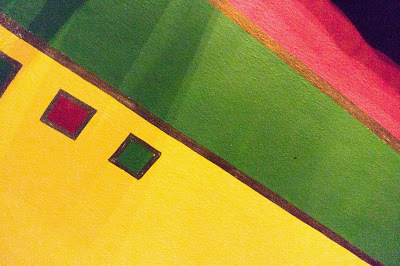 Thanks for your great efforts though, the painting really was a plus for the character of the front room. On a personal note, I would love to see you and Maurice again, even better if you would consider moving back to Albuquerque when you finish memorizing the Caribbean. 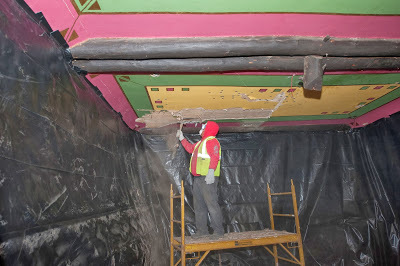 This, and the following few pictures are what was in place prior to removing in the January 2014 project. 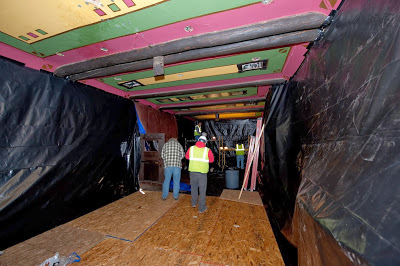 The furniture was removed from the front room, the walls and floor were tarped with plastic, plywood was laid on the plastic on the floor to protect the floor from falling debris, we were ready to go. 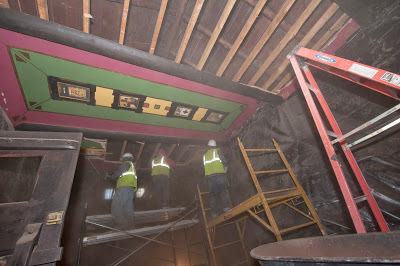 One of the workers starts tearing out the ceiling at the north end. The plaster is very fragile and crumbles easily. The work is well underway. It looks like a crappy picture, that is really dust in the air. Notice all the workers wearing hard hats, dust masks, and goggles. The two north end panels are removed except for the sides which is what the plastic tarping is taped to. There are no pictures because the photographer was up in the ceiling. All the existing electric was removed. 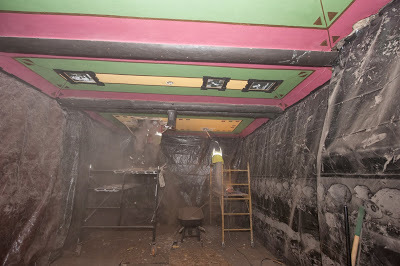 Finally, the edges of the plaster were removed and the tarps were taken down. 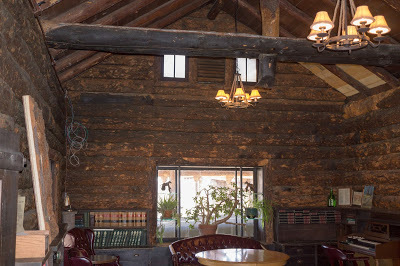 The ties on the two sides of the fireplace are not original. 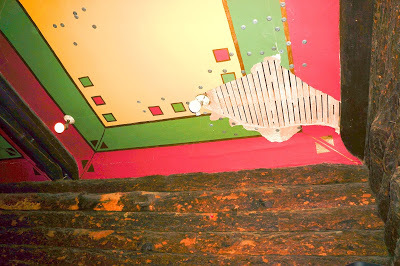 They are loosely set on the framing to support the 2X4's that supported the plaster lath. These ties were not even nailed to the framing. They will be removed. The front room is mostly cleaned up, We will have a guy vacuuming the walls and ceiling tomorrow. 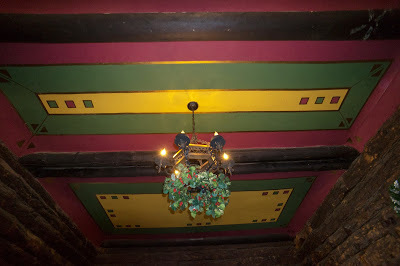 The original character of the front room has been restored. The king posts at the two trusses are pretty cool. Now we must clean, and clean, and clean. 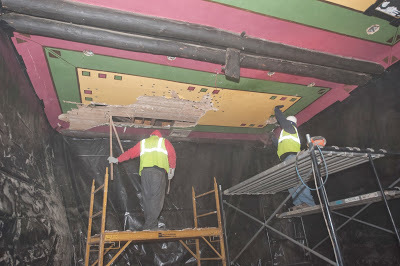 We are vacuuming every board on the ceiling, every viga, each truss, and each board on the walls. 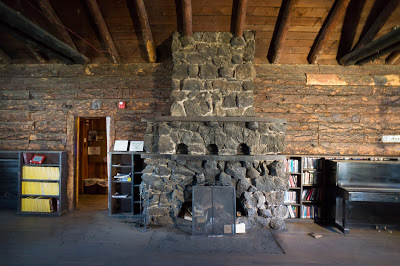 A view of our fireplace that hasn't been seen in 70 years. We will need to get windows made up for the north gable end. We need to get some matching stain for the deck boards that were replaced. 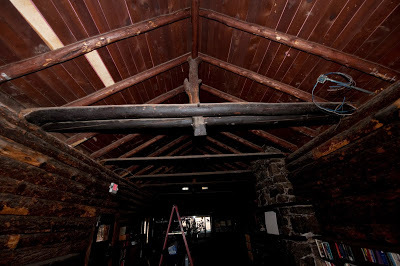 We need to touch up paint the black lower cords on the trusses. BUT, it's looking great. Over the next few days Jonathan and Thom will be installing the lighting. 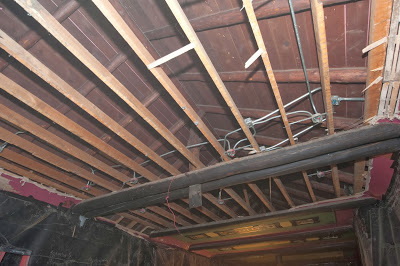 For the time being we will probably re-install the two chandeliers we removed. 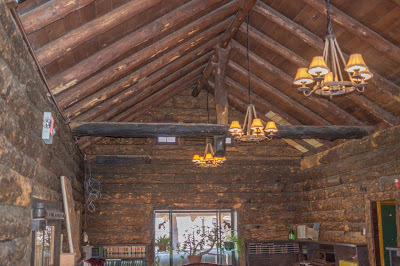 We have removed the extraneous plaster ceiling supports and vacuumed every board on the ceiling, every board on the walls, the horizontal cross-ties/beams and the truss king-posts. One man, 4 days with a vacuum cleaner. 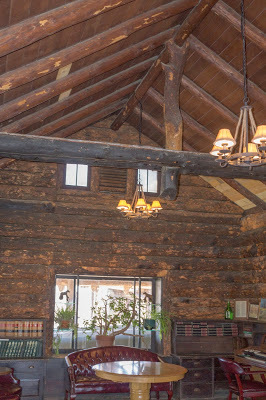 The original 1903 character and grandeur of the front room has been restored. Loose Ends: Staining: We still need to stain the boards that were replaced as part of the re-roof project and are now exposed. 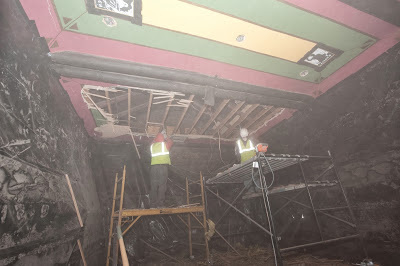 Viga Repairs: When the (now removed) plaster ceiling was installed in the 1940's some of the vigas were chopped up to accommodate the framing for the ceiling. Fortunately none of this is significant but, the work was very rough. We will need to sand this then stain it to restore the original character of the front room. 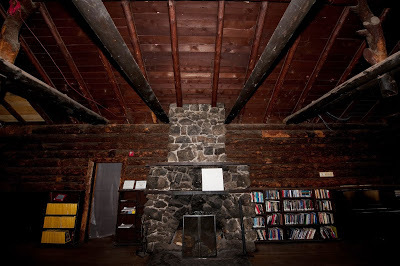 Upper Windows: The three upper gable windows on the north end are missing/damaged. 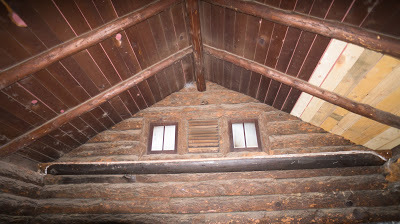 They will be replaced with new windows, constructed with insulated glass, to look like the original windows. The windows on the South end (two) will also be replaced with new insulated glass windows. 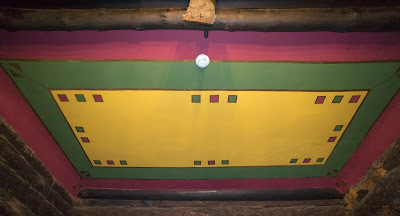 The center panel on the south was/is a louvered vent that was covered in the winter but open to allow escape of hot air in the summer. 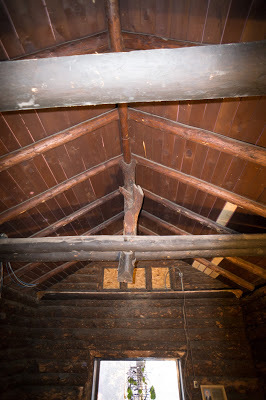 This will be removed, the location will be the location for the evaporative cooler inlet. Lower Windows: The front room windows are in poor shape, The leak air badly, the wood sashes are failing. These should be replaced but that will be another project.